What is Your Nederland Home Worth? Nederland is a small mountain town on the Peak to Peak Highway that’s just outside Boulder. There are about 1,500 people who call this old trading post and mill site home, and the city is a haven for music lovers, anglers, skiers, mountain bikers, and others who love the outdoors. Residents and tourists alike love this quiet valley town for its unique people, natural beauty, quaint and welcoming feel. Residents enjoy the independent shops, boutiques, laid-back lifestyle, slow pace, and myriad activities the area has to offer. The Eldora Mountain Resort is a quick five miles from Nederland, and it’s a small ski area that’s great for skiers and snowboarders alike, but there's also great backcountry access. 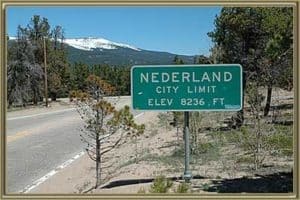 In summer, Nederland is home to a number of different festivals, including the High Peaks Art Festival, a three-day arts and music festival called NedFest, and the Old Fashion Fireworks and Festival on Independence Day. If arts and music festivals seem a little run-of-the-mill for Nederland, don’t worry—the town also hosts Frozen Dead Guy Days, a quirky festival in March that features live music, coffin races, poetry slams, ice sculpture contests, and much more. For history buffs, the Nederland Mining Museum is a must-see, and it features artifacts from the town’s mining days, and even has an old steam shovel on display. For the nature and outdoor lovers, make sure you check out the Mud Lake open space and Hessie Trailhead. Our Nederland, CO real estate agent will be more than happy to show you everything this unique mountain community has to offer. Along with showing you around to all the homes for sale in Nederland, CO, we can also provide you with interactive community maps, point out different attractions, things to do, and give you all the information you need about living in the area. Whether you're looking to buy or wanting to sell, make sure you stay on top of the market by signing up for your free personalized market report today. On top of showing you current trends, you'll also be able to see all the Nederland homes for sale, find out what homes have recently sold, and get insider information about sale prices. Call our agent today at 303-325-5690 to talk about your Nederland real estate needs. See all the Things to do in the Nederland & Black Hawk areas. If you're thinking about selling your home, start by finding out your Nederland home value instantly online. When you call our office, you can also speak to our agent about Nederland home values, get pre-listing advice, and schedule a free staging consultation. Online, you can also get access to our search tools to see all the for sale and under contract homes in your area. Review local market trend reports, which include information like appreciation in the area, average sale prices, list versus sold price percentages, average days on the market, and much more. Gold Compass Real Estate is headed by Mike Lies, and together with his team, they are your number one resource for real estate information. We’re local experts when it comes to real estate throughout the Foothills, and our user-friendly website can provide you with up-to-date information and MLS listings for Nederland and the Denver Metro area. Whether you're just curious about home values, are thinking about moving, or are already in the process of buying or selling, Gold Compass Real Estate can meet all your needs. We provide advice and guidance you can rely on when it comes to choosing an area and a home that suits your family. To schedule a viewing or to request a full market analysis for your home, call Gold Compass Real Estate today at 303-325-5690.